You'll hear plenty of figures being bandied around about the transfer speeds of interfaces. The fans of USB fans will tell you that USB 2.0 isfaster than FireWire 400; and FireWire 800 aficionados will tell you that their favourite interface is faster than, say, a SATA drive. We decided to look at how the various interfaces work in real-world situations. 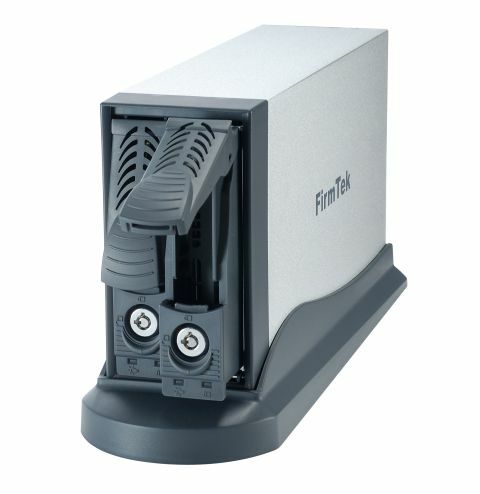 To this end, we have a SeriTek/1EN2 dual 3.5-inch SATA drive enclosure. The enclosure houses two SATA drives, which we have loaded up with two Western Digital 160GB models with Time-Limited Error Recovery, making them ideal for RAID use. Both drives are formatted and formed into a RAID, having connected them via two SATA cables and the supplied SATA PCI card. And, the real-world speeds are astounding! A respectable 43MB/s sustained transfer - our 2.6GB folder of files zipped across in just 58 seconds,compared to the sluggish three minutes and 40 seconds that our FireWire 400 drive managed. It was even faster than a FireWire 800 dual disk from Miglia. So why would you buy a SeriTek housing? Well, for one reason the drives are hot swappable. You can remove a drive and replace it with another without powering your Mac down. Secondly, the housing is very quiet and solidly built. Drawbacks include a limit on the cable length and having to use two connections to your housing, but it's considerably easier than trying to fit another two drives inside a G5. Having two swappable drives in one housing also makes for a very good method of backing up. If you mirror the drives and simply remove one "off site" each evening, you have your Mac protected. Of course, you don't get networkable storage as you would with a Network Attached Storage solution.